The Herd just got larger in numbers...and size! The Essa Stallions are proud to announce the signing of D-man Adam Leavoy! Leavoy, a familiar face with the organization, having played the 2016-2017 season with The Herd, returns to the team after spending last season with the OJHL's St. Mikes Buzzers. "We're very excited to have Adam back on the blue line for us. He's a big body, who is going to give our blue line a jolt. We've required some depth at the back end, and this is a major upgrade for us" said Head Coach and Director of Hockey Operations Sylvain Cloutier. "He's going to bring big game experience to the club, help us get where we need to go, and be a leader for us" added Cloutier. "Anytime you can add a player of Leavoy's skillset, is a huge benefit for any team. We're the lucky ones here in the scenario and we hope it pays off. We already have some standout D-men...Pan, Asplund, Ljungstrom to name a few. Boys are going to have to go out there and earn every second they get. Today, our team is better and much harder to play against" said GM and Assistant Coach David Lang. No time for welcome or congratulation cards as Leavoy will join the Stallions for the upcoming CPJHL Showcase in Potsdam, NY, where The Herd will play 4 games in 2 days. Stallions vs Smith Falls Settlers @ 10:15 a.m. Stallions vs Maniwaki Mustangs @ 2:00 p.m. Stallions vs Coldwater Ice Wolves @ 8:15 a.m. 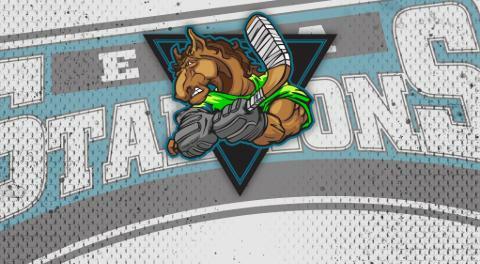 Stallions vs Muskoka Anglers @ 1:00 p.m.